Dec. 11 (Bloomberg) -- Kincora Copper Ltd. and Mineral Resource Authority of Mongolia have agreed to costs relating to mining licenses held by its subsidiary that were among 106 permits revoked in a court dispute, the company said today in a statement. * Resolution of the license dispute "is expected to support a more attractive exploration sector in Mongolia," president and CEO Sam Spring said in the statement. 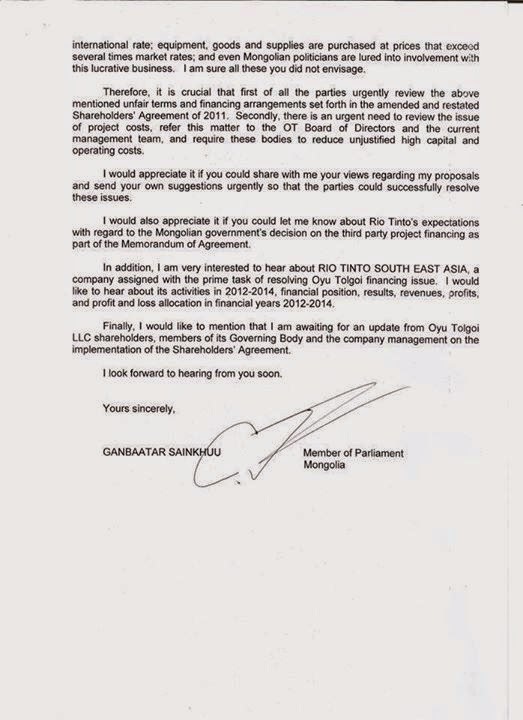 December 10 (GoGo Mongolia) Minister of State has been under interest of the MPs as this is the only position without any ministries under. Although there is no ministry structure under Minister of State, M.Enkhsaikhan is to be the focal point for the Mongolia's economy, becoming the only minister in charge of the megaprojects such as Railroads, Oyu Tolgoi, Tavan Tolgoi Power Plant Project and attracting of foreign investments. First ever meeting for the newly appointed Minister of State, who received his duties with the rising sun, will be with Sam Walsh of Rio Tinto, currently present in UB, as PM has emphasized to the MPs. Dec. 10 (Bloomberg) -- Mongolian Prime Minister Saikhanbileg Chimed's top priorities include resolving "disagreements" related to the Oyu Tolgoi copper mine, according to a statement released today by the Ministry of Foreign Affairs. 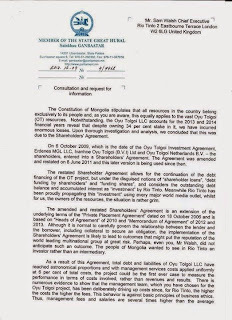 NOTE: The Mongolian government and Turquoise Hill Resources co-own Oyu Tolgoi LLC and have been addressing disagreements on the mine since 2013. The development of the Oyu Tolgoi copper–gold mine, located in Mongolia's South Gobi province, promises to rebuild the nation after two decades of economic and social instabilities following the 1990 revolution. While the company promotes the mine as the teleological solution to Mongolia's development, the state and public remain ambivalent, as concerns about a resource curse and Dutch Disease loom. In this paper, I argue that Oyu Tolgoi remains contested due to tensions between corporate and state actors as well as public concerns about the potential negative political, economic, and environmental effects of mining. Debates over the Oyu Tolgoi investment agreement negotiations and the immediate repercussions of the agreement signing reveal how the dual teleologies of building mineral nations crystallize in the neologism "Mine-golia." This paper begins to fill a gap in the literature on mineral nations which privileges the role of the state, leaving how corporations engage in nation-building underexamined. Ulaanbaatar, December 10 (MONTSAME) At the Stock Exchange trades on Wednesday, a total of 6,600 units of 14 JSCs were traded costing MNT nine million 669 thousand. "Hai Bi Oil" /4,600 units/, "APU" /905 units/, "Khokh gan" /385 units/, "Merex" /337 units/ and "Hermes center" /200 units/ were the most actively traded in terms of trading volume, in terms of trading value were "APU" (MNT three million 393 thousand and 895), "Hai Bi Oil" (MNT two million and 737 thousand), "Bayangol hotel" (MNT two million and 375 thousand), "Darkhan nekhii" (MNT 805 thousand) and "Mongol nekhmel" (MNT 114 thousand and 800). The total market capitalization was set at MNT one trillion 437 billion 185 million 661 thousand and 032. The Index of Top-20 JSCs was 14,757.01, decreasing 32.09 units or 0.22% against the previous day. December 4 -- Golomt Securities LLC, one of the leading brokerages in Mongolia, is introducing an Online Trading System for the first time in Mongolia. With this system, not only the Mongolian residents, but also Mongolians who work and study abroad, as well as foreign investors have equal access to the MSE trading. Traditionally, clients had to place their orders in-person, which was inconvenient and sometimes wasn't even possible. However, with Golomt Securities online trading system, clients receive the same service and the ability to manage their portfolios real-time online from any location with internet connection. Furthermore, detailed information on MSE trades which was not directly available to end customers in the past is available. Golomt Securities LLC provides the most efficient trading experience that enables investors to make instant decisions for the first time in Mongolia. Golomt Securities LLC is one of the leading brokerages in Mongolia which has successfully executed 49% of all secondary market transactions on the MSE in 2013. 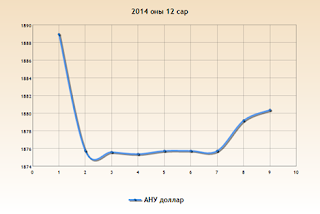 December 10 (Bank of Mongolia) Auction for 12 weeks maturity Government Treasury bill was announced at face value of 70.0 billion MNT. Face value of 82.0 billion MNT /out of 82.0 billion MNT bid/ Government Treasury bill was sold at discounted price and with weighted average yield of 15.731%. Ulaanbaatar, December 10 (MONTSAME) Head of the parliamentary Standing committee on budget Ts.Davaasuren Wednesday met with Ms Yuko Kinoshita, the International Monetary Fund (IMF) Representative for Mongolia. They exchanged views on the 2014 budget of Mongolia, an assumption of the 2015 budget and on debt management. The committee head said the 2014 budget will be clarified in conjunction of the formation of a new cabinet, and that the 2015 budget package will be amended as well. "We are attempting as much as possible to stop a broadening of the budget. We will focus on removing 'bubbles", he stressed. Present at the meeting were D.Otgonbaatar, an advisor to the Standing committee head on budget, and other officials. December 10 (GoGo Mongolia) Yesterday was a packed day for the MPs as the State Great Khural discussed the Ministerial Candidates, which started in the morning and ended at night with approval of M.Enkhsaikhan as Minister of State. Solution Government members were approved speedily one by one accompanied with mandates, instructions and encouragements from MPs. There were too many on the list to discuss and therefore it took day and night to appoint the whole cabinet. After the approvals the MPs and the newly appointed Ministers were busy with handing over the State Stamps, so that MPs pulled all-nighter at the Parliament Building. 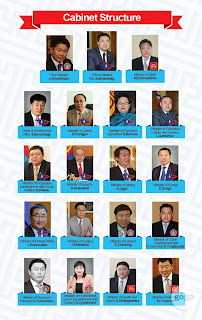 As a result Mongolia has now fully operational cabinet. MP J.Erdenebat might have been not famous yet for his political deeds, while the appointment to the Minister of Finance will lay the grounds for his future career as a politician. MPs, politicians and the mass will closely observe his actions from now on. As a person in charge of the state budget and economic relations of the country, he is to be under eyes of many on his policies and measures to be implemented to overcome the current economic downturn. It is clear enough for him that he is to steer the most troubled sector. J.Erdenebat has admitted the current economic downturn and emphasized that the first step of his actions as a Minister of Finance will be fundamental analysis of the economic crisis we are facing now and most importantly he will focus on the modification of the State Budget for 2015, by adjusting the budget to the economic capacities. Also he made sure that from now on Ministry of Finance would have tight budget policy as the debt payment approaches in 2017 and 2020, which was received by the MPs with a very positive sentiment. Some were even quick to note that new Minister of Finance is capable and skilled in this sector. Appointment of the G.Shiilegdamba, former Secretary General of MPRP, as the Minister of Health and Sports, was equal to comparing apples to oranges. As MPs had no choice but to approve him, MP Ts.Nyamdorj emphasized that crumbling health sector was in good hands of MPRP and that he was not sure if Shiilegdamba could save it further. Other than that, rest of the MPs made sure to note the necessities for building children hospitals in near future. DP group leader D.Erdenebat was unanimously approved for Minister of Industry, as there were almost no questions to the candidate as the Ministry of Industry is new in the cabinet structure. As a result PM Ch.Saikhanbileg had assembled his cabinet without much troubles and State Great Khural stated that it will be more supportive of the new cabinet and commissioned it to operate in a professional manner. For Ch.Saikhanbileg he succeeded with constructing his cabinet in just 3 weeks after his appointment to the Prime Minister. As he had said in his speech there are three sectors to focus for the new government, which are economy, economy and economy. Now it is time for operations for the Solution Government. Ulaanbaatar, December 10 (MONTSAME) In regard to the amendments to the Law on Minerals, made on the final meeting of the spring session of parliament, a decision was made to organize a bid for selecting the owners to the 106 licenses in 18 mining sites. The deadline for submission bids is January 9 of 2015, reports the Ministry of Mining on December 10. The bid was announced due to the cancellation of previous ownerships of the licenses by the decisions of three-stage courts. Selection process will begin right after the completion of the proposal submission. The companies must satisfy following requirements: to have paid 30 or more percent of the threshold price for the site of interest, to have no tax debts, to have no controversy over the court, and to have the financial capacity backed by guaranteed information from commercial banks. In order to cover the damages of the companies that operated on these sites, threshold prices were designated, and the price will not be duly paid in case the previous company bids on the site again, says the head of the Department for Policy implementation Management of the Ministry B.Batkhuu. Out of the total 18 sites, six are in Omnogovi aimag, four in Dornogovi aimag, others in Bulgan, Selenge, Khovsgol, Zavkhan and Tov aimags. The Authority for Minerals will provide detailed information about the threshold prices and geographic coordinates. 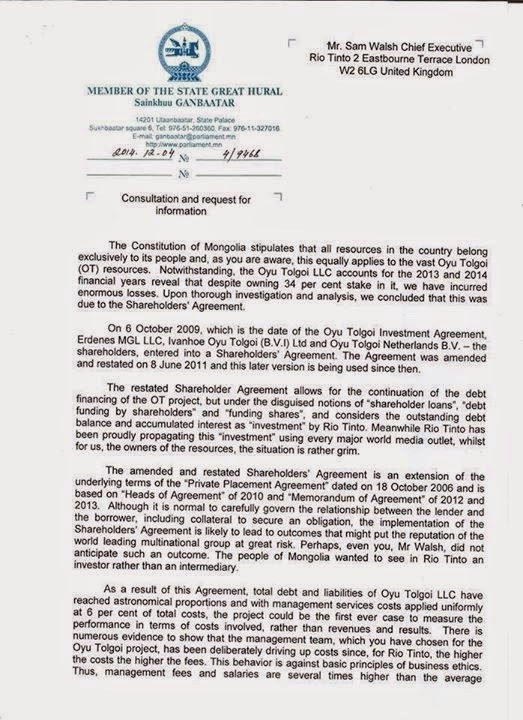 Dec. 5 (Bloomberg) -- A U.S.-Mongolia Transparency Agreement cleared by parliament today will ease business and investment opportunities in Mongolia, according to a statement by the U.S. embassy in Ulaanbaatar. December 10 (bne) An American businessman trapped in Mongolia is requesting emergency assistance from the UN so that he can return home, while the Central Asian country lauded for its democracy continues to bar hundreds of foreign investors from leaving. Mongolia's reputation as a investor-friendly destination and a democracy that respects human rights has suffered as foreign investors have become increasingly afraid to visit the country and worried about any new investments they might have made. With a growing number of expats complaining they are trapped in the country, many investors fear they could be the next ones barred from leaving if the authorities – perhaps for ulterior or corrupt motives – accuse them of crimes such as tax avoidance or fraud. Prime Minister Chimed Saikhanbileg, who last week won approval from the parliament to form a new government after taking office in November, has ordered an investigation into cases concerning at least 50 foreigners denied exit visas because of worries it is scaring away already scarce foreign direct investment (FDI). Foreign investment was down 57% in the first 11 months of the year compared with the same period in 2013, because of weak investor sentiment related to troubles in the country's mining sector and a soft market for mineral commodities. The prime minister hopes to give more context into these investigations into expats, because reports in media have provided few details of the cases, according to a December 8 statement from the government. 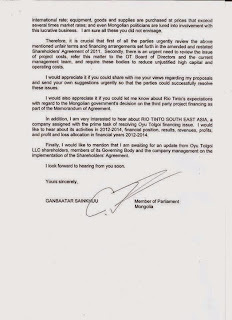 "The Prime Minister views that although the Government carries out the policy of supporting FDI, because of the actions of few individuals, issue will be raised that relate to the reputation of Mongolia," reads the statement, which was translated and disseminated by email to clients of Independent Mongolian Metals and Mining Research. Investors such as Justin Kapla, former president of the mining unit operating the Ovoot Tolgoi coal mine for Mongolia-focused miner SouthGobi Resources, has been barred from visiting home for more than two years because he is suspected of tax fraud. Kapla has requested to return home to visit a sick relative, but without success so far. "My grandfather (102 years old) was put in hospice care last week so I have made an emergency humanitarian request to have the travel ban lifted with the support of the [US] Embassy," Justin Kapla tells bne IntelliNews in an email. Another former employee at SouthGobi who was banned from leaving the country missed the passing of his father because the government denied a request for compassionate leave, says Kapla. "We are coming up on our 3rd Christmas of being banned from leaving." The UN Human Rights Committee has registered Kapla's human rights complaint, according to a letter viewed by bne IntelliNews. Mongolia's Prosecutor General has announced they were opening a new investigation after a judge returned the cases of tax fraud against Kapla twice as incomplete. Investigators are now looking at the transfer of licenses from the majority stakeholder of the time Ivanhoe Mines to SouthGobi in 2007 – five years before Kapla even became president of the mining company. Kapla told bne IntelliNews last May that dozens of exit bans had been placed on foreign investors in Mongolia. Simply opening an investigation into a foreign or Mongolian individual is enough for authorities to ban them from leaving the country. A letter from Minnesota Senators Al Franken and Amy Klobuchar sent to the Prosecutor General this week urges him to lift the ban "on a humanitarian basis," because of the health of Kapla's grandfather. Kapla is also requesting the support of US Secretary of State John Kerry in the matter. Mongolia's state-owned news agency Montsame on December 8 reported a message from the UN to Mongolia in observation of Human Rights Day that makes no mention of the exit visa bans. "We denounce authorities who deny the rights of any person or group," says UN Secretary General Ban Ki-moon, in a report that glosses over the fact the Human Rights Commission has recognized the exit ban on Kapla as an example of just that. Ulaanbaatar, December 10 (MONTSAME) A member of parliament R.Burmaa was elected the Minister of Food and Agriculture by a majority of MPs (91.5%) at the plenary meeting of parliament last night. During the voting, Yo.Otgonbayar MP said the state policy on wheat import "went wrong due to a postponing of the policy on food and agriculture", and underlined that the new Minister "should support land farmers". A.Bakei MP said the food and agricultural sectors are strongly depend on weather and bear the nomadic civilization, creating many jobs, "so the Minister always must carefully listen to farmers, food producers, engineers and technicians". Ms R.Burmaa graduated city's 52nd secondary school in 1975, Technical University of Bulgarian Sofia in 1982, Mongolian State University in 1987 and Management Academy in 1992. She has professions of electric engineering and management methodology. She was a scientist at the Institute of Physics in 1982-1988, an inventive engineer at the Mongol Firm in 1988-1992, a leader of the Social Progress-Women's Movement in 1992, a head of the Center for Children in 1997-1998, a head of the Center for Voters' Education in 1997, a member of the General Election Commission (GEC) in 2000-2006, a member of the national council of the Public Radio and Television in 2005-2008, a non-staff advisor to the President, and member of the Public Council at the Corruption Combating Agency in 2008. In 2012, she was elected the MP from the Democratic Party. R.Burmaa has a master degree on management and speaks Bulgarian, English and Russian. Ulaanbaatar, December 10 (MONTSAME) A newly appointed Minister of Mongolia Mr M.Enkhsaikhan is to take responsibility over the policy adjustment for forwarding the programs and projects of nation-wide significance. The Minister has no affiliate ministry. Enkhsaikhan Mendsaikhan was born in Ulaanbaatar in 1955, graduated the first secondary school in Ulaanbaatar in 1973, the University of Kiev in 1978 majoring in international economic relations. He is PhD of Economics, speaks Russian and English, had specialized trainings in the USA, Japan and Germany. Mr Enkhsaikhan worked as an economist and scholar at the Ministry of Foreign Affairs in 1978-1988, a deputy head of a department, a director of the Institute for Market Studies in 1989-1990, a deputy of the People's Great Khural, a member of the lower house of the State Khural and a head of a Standing committee in 1990-1992, a member of the State Great Khural in 1992-1993, and a Chief of Staff of the President's Office in 1993. He became the 18th PM in 1996. After two years in the office, he was ousted. Mr Enkhsaikhan was a director of Premier International LLC in 1998-2003. He emerged as a head of the Democratic Party in 2003, was elected a member of parliament in 2004, became a head of Standing Committee on security and foreign policy. The cabinet accepted him as a member in January of 2006 and appointed him Deputy PM. He established and led the National New Party, after separating from the DP. The Party was changed into Mongolian National Democratic Party, he was elected its head. In 2012, he was appointed a director of "Mongolian Railways" state-owned company for a short period of time. Ulaanbaatar, December 10 (MONTSAME) A member of parliament Mr L.Gantomor was re-elected the Minister of Education, Culture and Sciences at the parliamentary plenary meeting last night. 95 percent of the MPs voted for him. His profile was presented by Ts.Oyungerel MP, a member of the Standing committee on social policy, education, culture and sciences. Before the voting, the MPs asked him about education sphere's matters. Mr Gantomor underlined that it is time to focus attention on the quality of higher education rather than on its adequacy. The threshold of entrance exams of universities will go up, he added. Luvsannyam Gantomor was born in 1973 in Ulaangom of Uvs aimag. He graduated from the aimag's secondary school in 1991, Sendai College of Japan in 1996 majoring in telecommunication engineering, and Japan's Nagaoka Technology University in 1999--in electronics engineering. He worked as the president of Union of Democratic Youths from 2007. He was elected MP twice in 2004-2008 and 2008-2012. Ulaanbaatar, December 10 (MONTSAME) Deputy Prime Minister U.Khurelsukh handed the Ministerial seals the newly appointed Minister of Mining R.Jigjid Wednesday. Mr Khurelsukh noted that a formation of the Government for solutions has been based on the agreement between the political parties in order to overcome the economic difficulties. He again quoted the Prime Minister--"Economy, economy and again economy", emphasizing his full confidence that the new cabinet can free the nation form the difficulties. "The new Minister R.Jigjid is an experienced politician who worked many years for the State. I am confident in his leadership in this sphere, said the Deputy Premier and wished the Minister a success. Transferring the responsibilities, the former Minister D.Gankhuyag said the former Government of Reforms sustained the legal environment of the minerals' sector and that some implementation works are left incomplete. He wished Mr Jigjid a success in his work. Mr Jigjid served as the State Secretary at the Ministry of mining during the rule of the Government of Reforms. He promised to improve a quality of and continue the works conducted for the past two years. Jigjid Rentsendoo graduated 24th secondary school in Ulaanbaatar in 1977, State University of Mongolia in 1980 majoring in physics, the Japanese Shinshu University in 1985 majoring in engineering, and a Diplomatic training course in Japan in 1991. He worked as a director for Production in Gobi Corporation in 1985-1989, officer at the State Committee on Planning and Economics in 1989-1990, an advisor and a second secretary at the Asia Department of the Ministry of Foreign Affairs (MFA) in 1990-1996, advisor at the Mongolian Embassy to Japan in 1996-2000, advisor at the Asia Department of the MFA IN 2004-2006, an Ambassador Extraordinary and Plenipotentiary of Mongolia to Japan in 2006-2011, and as a State Secretary of the Ministry of Mining since 2012 until the time being. Ulaanbaatar, December 10 (MONTSAME) The head of the Cabinet Secretariat S.Bayartsogt handed Wednesday the Energy Minister's seal the newly appointed D.Zorigt. Mr Bayartsogt said D.Zorigt has been appointed as the "excellent politician and manager who is able to continue and conduct the works in the energy sphere commenced by the former Minister M.Sonompil". To this, the new Minister promised to provide a continuation of policies and activities of the sphere, to strengthen accountability and discipline, and to improve the management through proceeding with the Ministry staff in unanimity. Mr D.Zorigt graduated in 1977 41st secondary in Ulaanbaatar, Rostov City University of Civil Engineering in former USSR in 1982 majoring in engineering-economics. He worked as an officer at the "Compleximport" union of the State Committee on Foreign Economic Relations in 1982-1986, a deputy director of "Mongolian Building" union of the Committee in 1986-1989, a first deputy director of "Material Impex" union in 1989-1991, a vice director of "Stars" LLC 1991-1996, a head of the State Property Agency in 1996-1999, a head of the Board of "Mongolian Post" bank in 2000-2008. He was first elected a member of Parliament in 2008, and served as a head of the Parliamentary Sub-committee on Budget Expenditure Monitoring in 2009-2011, and a head of the Standing Committee on economy. Mr Zorigt was re-elected the MP in 2013. He was awarded a title "Foremost Figure for Banking and Finance" in 1999, "Polar Star" order in 2009, a "Foremost Figure for State Monitoring" title in 2010. Ulaanbaatar, December 10 (MONTSAME) A new Minister N.Tomorkhuu was appointed at the plenary meeting of parliament on December 9 for the Road and Transportation sphere, with an approval vote of 98.2 percent. The same day, G.Shiilegdamba was appointed the Minister of Health, and S.Chinzorig—the Minister of Labour. Tomorkhuu Namkhai was born in Guchin-Us soum of Ovorkhangai aimag in 1975, graduated the State University majoring in physics, and achieved master's degree in Business Administration at the University of Finance and Economy. Shiilegdamba Gankhuyag, the Minister of Health and Sports, was born in Ovorkhangai aimag in 1975, graduated Foreign Language University "Tsog" in 1996, Center London College in London in 1997, the Administration Institute in 1998, and achieved master's degree at the Maastricht University of Holland in 2004. His major is Tourism Management. Chinzorig Sodnom, the Minister of Labour, was born in Khujirt soum of Ovorkhangai aimag in 1964, graduated the State University in 1986, and Otgontenger University in 2005, majoring in planning economics, business administration and law. December 10 (infomongolia.com) On the occasion of the 25th Anniversary of Democratic Revolution, President of Mongolia Ts.Elbegdorj has issued a Decree to award the song "Khonkhny Duu" or "A Sound of the Bell" by late Sosorbaram TSOGTSAIKHAN with the State Prize of Mongolia. The award handing ceremony was held at the State Affairs Ger Palace on December 10, 2014 and President Ts.Elbegdorj handed over the State Prize to S.Tsogtsaikhan's son Ts.Tushig, where the late S.Tsogtsaikhan's spouse N.Natasha and "Khonkh" band singer, co-author N.Enkhbayar were present at the ceremony. The "Khonkhny Duu" (Honhnii Duu) song is a hit single and a symbolic song of Mongolian democracy since the 1990s. Ulaanbaatar, December 8 (MONTSAME) On the 25th anniversary of the Democratic Revolution, a ceremony ran Saturday to unveil the statue for late S.Tsogtsaikhan, the composer of the "Sound of Bell" song. All Mongolians know that this song became a hymn of the democratic movement in 1989. The ceremony was attended by Z.Enkhbold, the Speaker; S.Odontuya MP; D.Delgerbat, a head of the Citizens' Representative Khural of Bayangol district; S.Erdene MP, the Minister of Population Development and Social Welfare; D.Orosoo, the governor of Bayabgol district; and civil delegates. The statue is located in front of the "TBD Anduud" commercial center in the city's Bayangol district. Ulaanbaatar, December 10 (MONTSAME) On occasion of the Day of Democracy and Human Rights, wreaths were laid to the statue of J.Batmonh, a prominent political figure and the last leader of the People's Republic of Mongolia. Present at the event were M.Enkhbold, a chairman of the Mongolian People's Party (MPP); J.Monkhbat, the MPP secretary-general; U.Khurelsukh, the Deputy Premier; N.Nomtoibayar MP; family members and relatives of late J.Batmonkh. M.Enkhbold addressed the gathered. "J.Batmonkh served as the head of the Presidium of the People's Khural of Mongolia, the head of the Ministers' Council of the People's Republic of Mongolia and the secretary-general of the Mongolian People's Revolutionary Party (now MPP). His wise policy significantly contributed to the Democratic Revolution and it ran in a peaceful way, without any clashes," he said. Born March 10 of 1926 in Khyargas soum of Uvs aimag, Batmonkh Jamba started his career as a teacher of the Mongolian State University (MSU). He worked as the Prime Minister between 1974 and 1984, as the head of the Presidium of the People's Khural or Head of State between 1984 and 1990. December 5 (infomongolia.com) On December 03, 2014, the Transparency International NGO has released the 20th edition of the Corruption Perceptions Index, where more than two thirds of the total surveyed 175 countries in the 2014 Index score are below 50, on a scale from 0 (perceived to be highly corrupt) to 100 (perceived to be very clean). "The 2014 Corruption Perceptions Index shows that economic growth is undermined and efforts to stop corruption fade when leaders and high level officials abuse power to appropriate public funds for personal gain. Corrupt officials smuggle ill-gotten assets into safe havens through offshore companies with absolute impunity. Countries at the bottom need to adopt radical anti-corruption measures in favour of their people. Countries at the top of the index should make sure they don't export corrupt practices to underdeveloped countries", comments the chair of Transparency International, Jose Ugaz. In overall score, Denmark stands on the top in 2014 with a score of 92 followed by New Zealand (91) and Finland (89), while Sudan (11), North Korea (8) and Somalia (8) stand on the last places. In 2014 Corruption Perceptions Index, Mongolia was ranked at the 80th place out of 175 states with a score of 40/100 based on how corrupt a country's public sector is perceived to be, but compare to last year, Mongolia has been up-scaled from 83rd out of 177 countries. The Corruption Perceptions Index is based on expert opinions of public sector corruption. Countries' scores can be helped by open government where the public can hold leaders to account, while a poor score is a sign of prevalent bribery, lack of punishment for corruption and public institutions that don't respond to citizens' needs. 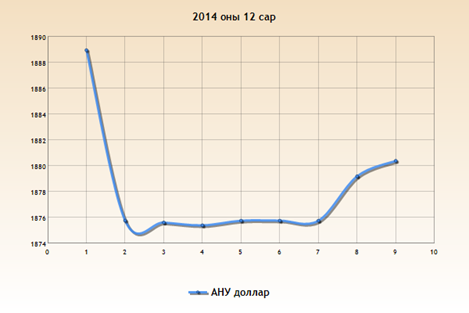 December 9 -- An encouraging month for Mongolia, November saw significant progress on the political front. After our letter to shareholders discussing the change of leadership, with Prime Minister Chimed Saikhanbileg replacing Mr. Norovyn Altankhuyag, a coalition between the incumbent Democratic Party (DP) and opposition Mongolia People's Party (MPP) was formed. Further, on Friday, December 5th Prime Minister Saikhanbileg proposed 19 new Ministers for 15 Ministries, thus setting the stage for a potentially prolonged period of political and economic stability. Canrim views these developments as long awaited positives. Now able to move forward and repair a sputtering economy, the reissuance of licenses is expected to happen in the coming months, led by a new and proactive Minister of Mining, R.Jigjid. Touching on operations, the company continues to review projects in the secondary market, several of which are currently of interest. Our burn rate remains in check and we will wait to scale operations until we begin acquisition of minerals properties. However, as the necessary "ingredients" are nearly in place, we expect Canrim's operations in Mongolia to accelerate into 2015. December 9 (State Department) On December 9, 2014, Under Secretary of State for Economic Growth, Energy, and the Environment Catherine Novelli presented the Secretary of State's 2014 Award for Corporate Excellence (ACE) to EcoPlanet Bamboo Group in Nicaragua, Wagner Asia Equipment, LLC in Mongolia, and The Coca-Cola Company in the Philippines. The annual award recognizes U.S.-owned businesses that play vital roles around the world as good corporate citizens in supporting sustainable development, respect for human and labor rights, environmental protection, open markets, transparency, and other democratic values. Wagner Asia Equipment, LLC in Mongolia, a heavy equipment dealership, was honored for its commitment to public-private partnerships with Mongolia's local and national governments to protect the environment, including through planting more than 900 trees; conducting workshops for students on environment and ecology; implementing a project to build a community garden; and rehabilitating a toxic waste site. Wagner employs persons with disabilities and provides employees with medical care and generous financing for housing. The winners were chosen from among nine finalists. The other six finalists were Chevron Corporation in Burma, ContourGlobal in Togo, General Electric International, Inc. in Tunisia, GlassPoint Solar in Oman, and The Linden Centre in China. More information on the finalists is available at http://www.state.gov/r/pa/prs/ps/2014/11/234206.htm. To download videos from the event, visit http://www.dvidshub.net/. After you register (free), you will be able to locate them by the "Award for Corporate Excellence" topic and today's date. December 9 (VietNamNet Bridge) – The intense performances that lasted seven minutes for designer Tsolo Munkh excited audiences. On the fourth night of the Vietnam International Fashion Week, the Mongolian French designer introduced a collection inspired by Buddhism and green steppe in Mongolia. Tsolo Munkh did not choose a vedette for her show. The performance only lasted for about 7 minutes, too short compared to the 30-40 minute shows at this fashion week. The models performed in groups, with fast, folding and strong steps. Also on the same night, Italian designer Antonio Grimaldi introduced his collection. December 5 (BCM) The terms of both B. Byambasaikhan, Chairman, and Randolph Koppa, Vice Chairman, were extended by the BCM Nominating and Executive Committees for calendar 2015. 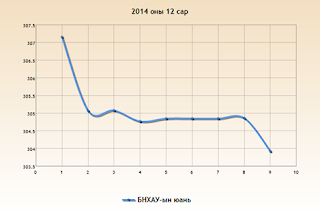 Byambasaikhan, CEO of Nova Terra, was initially appointed in December 2012. Randolph, President of Trade & Development Bank, was appointed in September 2013. "Byamba and Randolph's leadership and time commitment given their important day jobs have been greatly appreciated by BCM's Board of Directors and membership. We are very pleased at their willingness to continue to lead BCM in its partnership with private sector stakeholders in Mongolia's economic recovery," said Jim Dwyer, BCM's Executive Director. Ulaanbaatar, December 10 (MONTSAME) The re-appointed Minister of Education, Culture and Sciences L.Gantomor gave as a present to the Head of Cabinet Secretariat S.Bayartsogt a State Flag made of nano-material. This happened during the latter's visit to the Ministry to hand the seal to Mr Gantomor. Nano-cloths are being produced in Mongolia as designed by the professors of the Mongolian University of Science and Technology, explained Gantomor. He informed Mr Bayartsogt that the universities are thriving to become centers of innovations, and that some of them have even established a start-up company to conduct researches and studies and manufacturing. December 8 (news.mn) "The Mongolian Observer", a new bi-weekly English language magazine, is born. The founder and editor-in-chief is journalist Ch.Burenbayar, who issued the first English language newspaper in Mongolia, "The Mongol Messenger", 25 years ago. The new English language magazine focused on politics, economy, art and culture, released its first issue last Thursday, under a ceremony. The premiere issue of the magazine covered foreign affairs policy of Mongolia and the new geopolitical model. Readers will enjoy the cover story "Mongolia and the New Geopolitical Model" by essayist D.Bayarkhuu, "A Hard Won Freedom and Independence Through International Cooperation" by journalist and essayist G.Ganbold, "The Theory of Growing Together" by journalist and essayist T.Tumurkhulug, "The Bridge Spanning Asia and Europe" by Prof.D.Shurkhuu, "Upfront" by politician R.Amarjargal, and an interview with former Foreign Affairs Minister of Mongolia Ts.Gombosuren. Ch.Burenbayar promised that each edition of the magazine will cover a featured issue. December 4 (news.mn) The State Social Security Insurance General Office launched their forum "Healthy Workplace" and free courses in collaboration with the Occupational Safety and Health Management Institute of Mongolia today, on December 4th. The General Agency for Specialized Inspection has also released its September report on work-related deaths. In 2010 through 2013 and the first three quarters of 2014, a total of 1,414 occupational accidents were registered, which resulted in 237 work-related deaths. Reports from 2010 through 2014 reveal that 301 employees were left with disabilities following workplace injuries and work-related accidents, and 958 employees were left temporarily unable to work. According to reports by the General Agency for Specialized Inspection, occupational accidents are more common in the following sectors: mining, construction, roads and transport, education, and healthcare. The "Healthy Workplace" forum aims to launch management to prevent workplace injuries and occupational hazards, and support companies in improving labor safety and controls. December 9 (GoGo Mongolia) Residents of UB city have secret wish to have windy and snowy winters, because wind is the only brave counterpart for the smoke in winter times. Total of population of over one million is facing a REAL DANGER. Air pollution has become one of the triggering factors in declining health of the population and increased occurrences of respiratory allergies, central neural system illnesses, soaring cancer occurrences and other genetic malformations, leading to the tragic miscarriages or deterioration in embryo development, weak immune system in children and is seen as a major threat to the child growth development. · Winter season is when flu outbreaks happen most of the time. Many complain on cough even there is no evident sign of flu or common cold. · Children aged 0-5 are prone to cold and flu and are in danger to have developed into pneumonia easily. Pneumonia caused death among children aged 0-5 is listed in second place. · Allergy occurrences increased among the population. · Increased deterioration in embryo development, miscarriages and stillbirths. 40,187 newborns were registered in 2013, hence 546 case of neo-mortality were registered, which is the 10.98 percent increase compared to the previous year data. Infant mortality of children aged 0-5 registered in 2013 reached 1,438 nationwide and 45.68 percent of it applies to UB city alone. Respiratory disease is the main cause of the health problems among children under age of 5. Pneumonia, comprising 87.27 percent of the causes, is the leading cause of infant mortality. 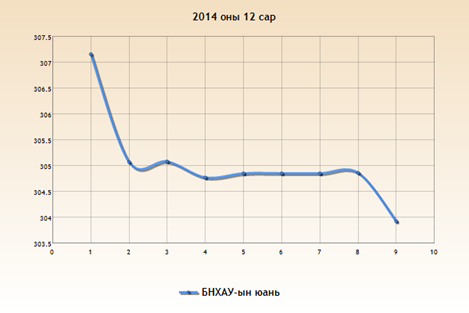 The below graph shows percentage of the respiratory diseases in children. Interestingly enough, 380 cases of birth defect were registered in 2013 and showed 13.68 percent INCREASE compared with previous year. There are not enough grounds or studies held to prove that these numbers increased due to the air pollution, but it definitely calls for the need to conduct one. Burning coal for domestic heating may contribute to early fetal death according to a new study by experts from The Saban Research Institute of Children's Hospital Los Angeles and Ulaanbaatar, Mongolia – the coldest capital city in the world. In a paper published in the journal BMC Pregnancy and Childbirth, researchers report "alarmingly strong statistical correlations" between seasonal ambient air pollutants and pregnancy loss in Ulaanbaatar (UB), Mongolia. The scientists, led by David Warburton, OBE, DSc, MD, MMM, FRCP, FRCS, FRCPCH, professor of Pediatrics and Surgery at The Saban Research Institute of Children's Hospital Los Angeles and Keck School of Medicine at the University of Southern California, examined the association between spontaneous abortion (miscarriages) and seasonal variation of air pollutants. The measurements were gathered near the National Center for Maternal and Child Health (NCMCH)—which provides the majority of obstetric and gynecological services in UB—and compared to the medical records of 1,219 women in the region who had been admitted to the hospital between 2009 and 2011 due to fetal death prior to 20 weeks gestational age. Monthly average ambient levels of air pollutants showed increases in relation to the duration of hours of darkness, as well as the coldest temperatures—when Ger heating stoves are used most. Additional contributors to the study include Davaasambuu Enkhmaa, Badrakh Javzandulam, Jadambajav Uyanga, Yarinpil Khishigsuren and Shonkuuz Enkhtur, National Center for Maternal and Child Health, Ulaanbaatar, Mongolia; Nicole Warburton, Mills College and The Saban Research Institute, Children's Hospital Los Angeles; and Sereeter Lodoysamba, The National University of Mongolia, Ulaanbaatar. HOW MUCH BUDGET IS SPENT TO FIGHT THE AIR POLLUTION? Clean Air Fund was established in 2011 under Special Fund of Government of Mongolia to reduce and fight the Air Pollution in UB city. This agency is funded from the State Budget and donations of international organizations. These are numbers that apply only to Clean Air fund operations, while there are numerous project and programs run by different agencies and organizations. Cold and flu medicine prices start at MNT 1000, while some medication for children might cost parents MNT16,000 -25,000. Parents spend enormous amount of money on cold medications each year to avoid any complications associated with common cold. These expenses are sure to rise in the coming years. Another issue that is evident already now is the need to open up hospitals, which focus on contagious respiratory diseases only, as the number of occurrences skyrocket every year and is involving not just children, but adults and elders. In this sense, air pollution is the visible threat not only for health, but also to economic welfare of the households. On national level, air pollution is starting to threaten the national security, by imposing health issues, which further looms population growth. Economically the budget allocated to fight with air pollution is to increase further. December 7 (M.A.D. Investment Solutions) M.A.D. takes an in-depth look at the historic urban centre of Ulaanbaatar, the social fabric surrounding it and explores some of the recent plans for redevelopment focused on this area. The video examines the life of some of the residents of the 40k and 50k buildings that make up the city's urban heritage and looks at the impact that any such redevelopment may have. Finally the video seeks to explain what it is that makes the city centre so vibrant and why it must be preserved at all costs for our future generations. December 5 (infomongolia.com) On December 05, 2014, the Governor of the Capital City and Mayor of Ulaanbaatar E.Bat-Uul received a delegation from the European Bank for Reconstruction and Development (EBRD) headed by Director for Central Asia and Mongolia at EBRD, Mr. Masaru Honma. During the meeting, authorities inked the Memorandum of Understanding on cooperation to implement a Project on the Solid Waste Management Reform. The Capital city has been implementing several tasks to improve the UB waste service and waste recycling facilities through its "Public Service UB Unit", a local administration-owned enterprise, and under this MoU, the EBRD provides a longterm loan of up to 12 million EUR to finance the Project on the Solid Waste Management Reform in Mongolia. December 5 (news.mn) With support from the "For Every Heart" project initiated by actress I.Odonchimeg and MobiCom Corporation, a new school has opened for homeless and poor children at Ulaanchuluut Dumpsite. Hundreds of homeless children live without access to education and pick for scraps at Ulaanchuluut Dumpsite to earn a living. MobiCom Corporation funded NGO "Communication Development Center", in charge of the future development of the project, provided 80 million MNT for the purchase of 2.2 hectares, a 55 м2 school facility, a minivan to transport students to and from the school, school books for 55 children, plus and school supplies, food, and other necessary items for daily activities at the school. The school will run 3-4 daily shifts for children. There is also a basketball court, walkway, parking and green development planned for the site. Well-wishers, individuals and companies are still being encouraged to donate to the charity. December 9 (The Diplomat) At the end of October it was announced that Mongolia will host the 2016 Asia-Europe Meeting (ASEM). While this was reported in a number of local and international outlets, there has been little discussion of what it might mean for Mongolia – a reflection perhaps of the relatively unknown status and remit of ASEM. Nevertheless, ASEM 2016 will be by far the largest diplomatic gathering in Mongolia's history, and could have far-reaching implications. The Asia-Europe Meeting (ASEM) was founded in the aftermath of the Cold War, with the European Union, ASEAN, China, Japan, and South Korea agreeing to establish a forum for dialogue and cooperation between two regions that were becoming increasingly interconnected. The first meeting took place in Bangkok in 1996, and ASEM has since expanded to its current headcount of 53 member states (with Mongolia joining in 2008). It focuses on addressing three pillars or areas of cooperation: political, economic, and social, cultural, and educational – with regular ministerial meetings and biennial meetings of heads of states or government driving ASEM forward. In addition, it has one permanent institution, the Asia Europe Foundation, which works to promote intercultural dialogue and educational exchanges between the two regions. ASEM describes itself as an informal and multidimensional partnership of equals that facilitates dialogue and policy exchange, as well as granting its members the opportunity to manage growing Europe-Asia relations. Despite this lofty rhetoric, in terms of substance ASEM is a means of establishing norms of cooperation and consultation rather than a forum for addressing geopolitical challenges or promulgating binding decisions and initiatives. In layman's terms, it might be described as a talk shop – reacting to events and issuing communiqués full of diplomatic platitudes rather than driving the international agenda. Its extensive scope, wide range of members, and lack of permanent institutions means that it cannot, at present, move beyond informal dialogue, but despite its relatively modest profile, hosting ASEM in 2016 represents a major success for Mongolian diplomacy. Forty-three heads of state or government attended the 10th Asia-Europe Meeting held this year in Milan – a tally that is likely to be exceeded given that 2016 will mark the organization's 20th anniversary. Although there will be considerable logistical and organizational challenges in hosting such a large number of statesmen in Ulaanbaatar, the decision to select Mongolia as host is significant both in terms of what it says about Mongolian diplomacy as well as the opportunities it will offer to the country. First, hosting ASEM represents a major success for the activist and ambitious foreign policy that Mongolia has pursued under President Tsakhiagiin Elbegdorj. Since assuming the presidency in 2009, Elbegdorj has devoted most of his attention (some might say too much) to foreign policy. Some of the key developments witnessed during his tenure include the promotion of the Ulaanbaatar Dialogue on Northeast Asian Security and the beginning of formalized trilateral cooperation between China, Mongolia, and Russia, as well as efforts to establish diplomatic relations with all UN members. In addition, Mongolia has aptly positioned itself in China's effort to promote its diplomatic profile and reshape regional affairs. Earlier this year it was announced that Mongolia would be able to become a member of the China-driven Shanghai Cooperation Organization, while it has also become a founding member of the Asian Infrastructure Investment Bank, a new development bank pushed by China and interpreted by many as a rival to the Asian Development Bank and World Bank – driven by Japan and America respectively. Finally, Mongolia is set to benefit from Beijing's "New Silk Road Strategy" through investments in infrastructure and connectivity. With Mongolia's domestic politics and economy having been on a downward trajectory over the last two years, international diplomacy stands out as a bright spot, and playing host to dozens of international statesmen at ASEM 2016 will represent both a personal triumph for Elbegdorj as well as a more general success for Mongolian diplomacy. For the former, presiding over ASEM represents an opportunity to establish a legacy as an international statesman before the expiration of his presidential term in 2017 (his last allowed under the constitution). If, as rumored, he has ambitions of moving on to a job in international diplomacy, then successfully hosting ASEM can only help his aspirations. As for Mongolia, it will find itself in the international spotlight. For a frontier economy like Mongolia, such high-level international exposure comes rarely and will represent an opportunity to boost its profile and attract investment, but the extent to which this will be achievable will depend on whether Mongolia can put its domestic affairs in order. This is particularly important given that ASEM will take place on the heels of the 2016 legislative elections – with at most a month separating the two. Between now and then, achieving both policy and political stability must be the priorities for Mongolia, as this represents the best method to reverse the downward spiral into which the country has fallen. The measures that need to be implemented – for example putting an end to political infighting, resolving outstanding investment disputes, and guaranteeing fiscal prudence and stability – are well known and have been elaborated both domestically and abroad. At present, however, it is far from assured that the requisite factors for stability will be in place. Fortunately, there is ample time for Mongolia to turn things around between now and when the coterie of international statesmen descends on Ulaanbaatar. Were Mongolia to act as host following a successful election and during a renewed boom, the country would be seen as an example of a successful democracy and a dynamic economy, and this news would no doubt spread wide and far. The risk though is of a bitter election campaign in which populist promises endanger macroeconomic stability and scare off investors, with subsequent negative press engendering enduring negative consequences for the country's reputation. Ultimately, Mongolia can only benefit from the attention of ASEM if that is avoided. William Turner is Director of Research at M.A.D. Investment Solutions. Prior to moving to Mongolia, William studied international relations and has since lived and worked in the United Kingdom, Cambodia, and Belgium. His primary research interests focus on the role of multilateral organizations in international security in the Asia-Pacific region. This article is written in a personal capacity. December 10 (news.mn) Mongolia and Russia held the first consultative meeting on media between foreign affairs ministers in Ulaanbaatar, on December 9th. The consultative meeting was chaired by Deputy Director of the Policy Planning and Research Department of the Ministry of Foreign Affairs of Mongolia G.Amartuvshin and Deputy Director of the Information and Press Department at the Russian Foreign Ministry Alexander Bikantov. At the meeting, the parties emphasized the rapid development in traditional friendly relations and cooperation between the two countries, then agreed that promoting bilateral cooperation between the press departments of the foreign affairs ministries of both countries, increasing journalist exchanges, and keeping up reciprocal visits would play a significant role in furthering bilateral relations and cooperation. Both sides then agreed to hold the consultative meeting annually. On the same day, Secretary General of the Foreign Affairs Ministry B.Boldbaatar met Deputy Director Alexander Bikantov and exchanged opinions. Ulaanbaatar, December 10 (MONTSAME) The Speaker of parliament Z.Enkhbold Wednesday received visiting Mr Axel van Trotsenburg, the World Bank East Asia and Pacific Regional Vice President. The sides exchanged views on the present budget of Mongolia and on projects and programmes to be implemented by the WB in Mongolia. Mr Trotsenburg said he is here to share with related people his opinions on resolving urgent problems facing a development of our country and on possible support from the WB. The Speaker said it is possible now to realize the "Sustainable livelihood-3" project under a soft loan from the WB, adding that other projects are very likely to be realized because the new cabinet has been formed. He also noted that parliament is to discuss a bill on debt management this year, and emphasized that a general understanding about international financial terms will be introduced in the country. December 5 (infomongolia.com) On December 04, 2014, Chief of Staff of the Office of President of Mongolia P.Tsagaan received in his office the Regional Director of the World Organization for Animal Health (OIE), Mr. Francois Caya. At the meeting, Regional Director F.Caya introduced the preparation works of the Conference of Ministers of Pastoralist Countries to be organized with support of the OIE in Mongolia in June 2015. Back in December 2009, the President of Mongolia Ts.Elbegdorj sent a Letter to the OIE Director General, Bernard Vallat forwarding 5 proposals expressing readiness to collaborate with the organization. One of them was to collaborate on formulating the standards for the identification of animal health status that best suits for the unique nomadic and pasture based animal husbandry system. In the same month, the OIE Director General Bernard Vallat replied to an official response letter expressing his readiness to cooperate. Moreover, Director General Bernard Vallat paid a visit to Mongolia in May 2012 and during his visit, Mr. Bernard Vallat held meetings with the President and Prime Minister of Mongolia and during the meetings they agreed to collaborate on formulating animal health status identification standards appropriate for the unique nomadic and pasture-based animal husbandry. They had also decided to partner for a long-term base, in particular, to organize a Conference of Ministers of Pastoralist Countries in Mongolia and set up an orientation of further cooperation. Moreover, collaborate effectively on developing international standards, rules and regulations to formulate and implement animal health status reflecting the unique nomadic and pasture-based animal husbandry. During the meeting with Regional Director F.Caya, Chief of Staff of the Office, Mr. P.Tsagaan noted his readiness to host the upcoming Ministerial Meeting and expressed that Mongolia with its 60 million heads of animal is interested to export meat and meat products. Moreover, Mr. P.Tsagaan mentioned that during their visits to Mongolia in August and September of 2014, the heads of state of the People's Republic of China and the Russian Federation expressed willingness to import meat and meat products from Mongolia and in this regard, Mongolia is seeking support from the OIE to collaborate on formulating the standards for the identification of animal health status and on meat export issues. December 8 (China.org) A series of 100 photos of Mongolian natural reserves, including the infinite prairie, the Gobi Desert, the aquamarine sky and vibrant wildlife, went on display in the Beijing Capital Library on Dec. 6, 2014. The week-long photo exhibition, which lasts till Dec. 14, 2014, opened amid the Mongolian Cultural Week jointly organized by the Chinese Ministry of Culture and Mongolia's Ministry of Culture, Sport and Tourism, and sponsored by China Arts and Entertainment Group. Chinese audiences can get a better understanding of their neighbor through the virgin prairies and abundant wildlife showcased at the photo exhibition and the accompanying cultural performances telling the history of Mongolia, said M. Tumenjargal, deputy minister of Mongolia's Ministry of Culture, Sport and Tourism. Li Shugang, a Chinese photography aficionado, was attracted by the natural scenery and wildlife captured by her Mongolian peers. "I have been captivated by the vividness of the animals that those Mongolian photographers must have searched for, waited for and framed so arduously." According to BAYANZUL Zagarjav, head of Mongolia's Department of Culture and Art Policy Implementation and Coordination of the Mongolian Ministry of Culture, Sport and Tourism, local photographers spent one year in the least populated areas of the country to take these photos. From the photos, people can see the swift changes of the seasons as the temperatures fluctuate from 40 degrees Celsius in summer to negative 50 degrees Celsius in winter across a territory of over 1.5 million square kilometers populated by just about 3 million people, said Zagarjav. It is a Mongolian tradition to instill admiration for the sacredness of nature in their children, Zagarjav asserted. China and Mongolia launched the cultural programs during "The Year of Friendly Exchanges" in 2014 to mark the 20th anniversary of the Treaty of Friendly Relations and Cooperation signed between the two countries and to mark the 65th anniversary of the establishment of bilateral diplomatic ties. In August 2014, thousands of Mongolians flocked to a Chinese Cultural Week comprised of bilateral talks, forums, performances, tea ceremonies and exhibitions in Ulaanbaatar, the capital of Mongolia, to get a closer look at China. Eighteen cultural pacts were signed between the two countries during Chinese President Xi Jinping's visit to Mongolia that month. "Exchange in the cultural sector is not only about cultures, but also about the adequate confidence of the two countries' peoples in the construction of their bright futures," said Ding Wei, deputy minister of the Chinese Ministry of Culture. The Gobi Altai mountains in Mongolia are a semi-arid region, where nomadic herders migrate every year between their spring, summer and winter camps. To survive they depend on healthy livestock - goats, sheep, cattle, horses, camels and yaks - which need food, water and a safe and warm shelter during the winter. For some of the 2000 herders of Tseel soum (a district in the Gobi Altai region) their livestock are threatened by the new Tayan Nuur iron mine, owned by the Mongolian company Altain Khuder. Located only about 168 kilometers from the Chinese border, the Tayan Nuur mine exports its production to steel mills in Mongolia's southern neighbour. Over the course of five years its output increased fivefold to 2.2 million tons in 2013. Because of this aggressive expansion the mine is expected to have a very short lifespan of merely 10 years. In contrast to Altain Khuder's short-term interest in the region, the Tayan Nuur mine is disturbing a delicate balance that generations of herder families have established. Trucks transport ore from the mines to China via a nearby gravel road that cuts through animal pasture. The trucks travelling the road create asuffocating amount of dust. Munkhuu, a local camel herder, says that his animals are getting sick since the trucks started moving ore from the mine. For Munkhuu and others like him, moving camps is not an option. Herders have used the same plots of land for generations for a reason, because specific pastures are suited to specific animals, and access to fresh water is an ever-present concern. Grazing animals travel on their own covering distances in this region between 5 and 50 kilometres before returning to camp. The new black-top road that is under construction could reduce the dust but the way it is being built at the moment could prevent animals from crossing it safely. Warm and durable winter camps are herders' most important posession. Herders stay in their winter camps for six months every year. Over the years, the durable animal shelter gathers many layers of dung that provide insulation from the cold earth - a matter of survival for the animals and their offspring. Much of the land is owned by the Mongolian state, but the local community decides which family uses which camp (and the surrounding land) and herders can pass on this right within their family. To respect this customary law, Altain Khuder had to agree with the local community how herders should be compensated for the loss of their land. Yet herders told us that the company instead told them individually that they had to give up their land to make place for the mine. The goat herder Khoninkhuu tells us how a company representative exploited her trust and made her give up her camp in exchange for 5 million tugrugs (~ 2000 euros), a sum much lower than her camp was worth. Khoninkhuu was not aware that she could never use her winter camp again. December 10 (news.mn) An original, exclusive work by Zanabazar, who was one of the greatest Buddhist sculptors in Asia in his time, is to be auctioned by Sotheby's in Paris, on Thursday, December 11th. The work is a 17th century bronze Ногоон Дарь эх (Shyama Tara) by the First Bogd of Mongolia, Undur Gegeen Zanabazar. The expected final sale price for the work is expected to be 200,000 to 300,000 EUR. The current owner of the Shyama Tara bought it in Paris, in 1954. December 10 (news.mn) The XVI World Assembly of Youth (WAY) General Assembly, "Youth Leadership Succession: Past and Future", is being held in Tirana, Albania. A report from Tirana says that the first Mongolian national has been elected as a member of the board of the assembly through 2018. President and CEO of the Mongolian Youth Federation A.Munkhbat was elected as Vice President of Asian Department of WAY General Assembly. The WAY General Assembly, held every four years, elects a board consisting of a president and five vice presidents who are in charge of continents. The assembly has 120 member countries worldwide and was founded in 1949. BOZEMAN, December 9 (MNT News) - Mongolia and Montana are two regions with striking similarities, including landscape, weather and economy. That's part of the reason Montana State University is working to bring more Mongolian students to Bozeman, which they say is an excellent fit. "You won't have any problems when you study here, and also Montana State University has lots of personalities to support you in learning," sister city scholarship winner Nergui Enebish said. Enebish 33, and Batmaa Baterdene, 18, are the first to take part in the sister city exchange between Murun, Mongolia and Bozeman. They met with city leaders Monday to wrap up their three-week stay in Montana, sharing pictures, gifts and a letter to encourage more sister city exchanges. During their visit, they toured the city of Bozeman, Yellowstone National Park, Bridger Bowl and went cross country skiing. They will take pictures back to Mongolia to create a presentation, which could air on national television to encourage more students to take part in an exchange. They said there are some things they enjoyed most about the trip to Bozeman. "Traffic rules and also the friendly atmosphere and also peaceful, it's very peaceful here," Enebish said. The exchange program started in 2006. This is the first time the Mongolian government has contributed to the cost of an exchange, which organizers hope will continue as Mongolia's economy improves. According to the MSU International Office, there are six full-time students enrolled now. DHARAMSHALA, December 5 (Phayul.com) The Tibetan spiritual leader His Holiness the Dalai Lama today concluded four-day teachings for a group a Mongolians, expressing hope to meet again in Mongolia next year. On the last day of the teachings today, His Holiness conferred the Avalokiteshvara Empowerment here at Tsugla khang, the main temple in Dharamshala. Around four thousand people from 48 countries including 700 Mongolians attended the teachings on Tsongkhapa's "Great Stages of the Path". His Holiness the Dalai Lama said that it is important to have right motivation to receive the initiation. "You need to have right motivation to take this initiation of Avalokiteshvara Empowerment. You should not have motivation of such things as wanting to have wealth, success and longevity in this life alone. Because that is the wrong motivation," said the Dalai Lama. He said that one should be motivated to attain omniscient state of Buddhahood. "The purpose of Buddhism is not to gain wealth and it is the liberation that we are looking for in this life. Therefore when it comes to doing practices of dharma, we have to be really careful in our way of how we carry about the practice of the teaching of the Buddha," His Holiness added. "You should know yourself and not just jump to conclusion and jump to some higher practices without really having the qualifications. Otherwise it is not good. Therefore, when you do the practices what you need to do is follow the orderly manner of practicing the dharma so that you will be able to become more and more adapt to the teachings, the practices so that you can make progress higher and higher." His Holiness also offered prayers for His Eminence the Ninth Khalkha Jestun Dhampa Dorjee Chang Jampel Namdrol Choekyi Gyaltsen, the spiritual head of the Jonang tradition of the Tibetan Buddhism and the spiritual head of Mongolia, who passed away on March 1, 2012 in Ulaanbaatar, Mongolia. From December 12-14, His Holiness the Dalai Lama is scheduled to visit Rome, Italy, to attend the 14th World Summit of Nobel Peace laureates which was chosen after South African government refused visa for the Tibetan leader. He will then continue his teachings on the 18 Great Stages of the Path (Lam Rim) Commentaries in Mundgod at the request of Ling Choktrul Rinpoche and Gaden Sharte Monastery from December 23- 29. December 8 (UNICEF Blog) Ulzichimeg is a small girl with hair so long that looks like it has never been cut. When school started on September 1st, Ulzichimeg joined her two older sisters at the local soum school a full day's travel away from her family by reindeer. The six year old lives with her mother Bolormaa, father Naranjargal, older sisters Ulzisaikhan, 13, and Ulzisetseg, 12 and younger brother Tushinbyar 2 in a teepee (a traditional mobile house) in Khuvsgul Province, northern Mongolia. During the school year she lives in a dormitory with her two other sisters and other students. "I like school because you learn many things," she says. "At school I have friends and there are toys. I also like being close to my sisters. They help me with my homework and take good care of me". Ulzichimeg is one of the Tsaatan people, otherwise known as the reindeer people. The Tsaatan people are nomadic and herd reindeers, moving when the seasons change to meet the needs of the reindeers. Given that they are nomadic ensuring education for their children is hard. When children reach school age they go to the local soum school and board at the dormitory during the school year. The school can be at least a day's travel away and because there are no roads, people have to travel by horse or reindeer. Providing early childhood education opportunities for the community is a challenge. Instead of a traditional kindergarten where students come Monday to Friday, the district runs an intensive 21 day kindergarten school during summer for the children of the Tsaatan people. The school, housed in two teepees (traditional housing for the Tsaatans), educates up to 25 students aged two to six each summer. The parents bring their children to the kindergarten on reindeers. For the last two summers Ulzichimeg attended the intensive kindergarten. "I really liked kindergarten," she says. "My favorite thing was washing my hands. Drawing was also nice". Bujmaa was Ulzichimeg's kindergarten teacher last year. Now she is teaching second grade at the school that Ulzichimeg is attending and regularly checks in on her. "Ulzichimeg was a good student," she recalls. "She was very good at memorizing things like songs and poems. She has a lot of energy and can be a little bit naughty". "Kindergarten helped her prepare her for school. When students come they have never sat on a chair or at a table before. They learn to do that for the first time at kindergarten. They have also never held a pen or pencil before, so they have to learn that as well. We teach them to sing songs and learn poems that are new to them. "The families live on their own, so during the year they do not see children outside of their siblings," she says. "Kindergarten provides them with a great opportunity to socialize and get use to things like sharing and playing with others." "Because she had been to kindergarten, when Ulzichimeg went to school, she knew what it would be like. She knew how to sit at a desk in class and that she would be staying in the dorm with her sisters. She is doing really well." Attending kindergarten helped Ulzichimeg's transition to school go smoothly. She was prepared to learn and was able to adapt to her new learning and living environment. Tsendmaa, the kindergarten director for the soum says that they put a lot of effort into making the transition to school easy for the children. "When children graduate from kindergarten to school, the teachers will take them to the school and in a way, hand them over to their new teachers," she says. "This helps them move smoothly into primary school". Both Tsendmaa and Bujmaa agreed that grade one teachers preferred having children who had been to kindergarten in their classes. "Teachers want to take children who went to kindergarten because it is easier," Bujmaa explains. "They know who went to kindergarten and sometimes fight to have those students in their class. Adapting to school is very hard for children who didn't go to kindergarten". For the Tsaatan people the summer kindergarten is the only opportunity for their children to receive early childhood education. While the families know the benefits of kindergarten it is impossible for them to access regular services. Many other Mongolian children also miss out on early childhood education. Only 68 per cent of kindergarten aged children are enrolled in early childhood education. UNICEF Mongolia's Early Childhood Development Officer Tsendsuren Tumee explains, "In Mongolia there are more families wanting to send their children to kindergarten then there are places for them. Because of this many children miss out on the incredible benefits that early childhood education brings". "UNICEF is helping children reach their full potential by increasing access to quality early childhood education," Tsendsuren explains. "We also want to make sure we are reaching the children who are hardest to reach. For the Tsaatan people UNICEF supported the establishment of the summer kindergarten. We provided the teepees, furniture, toys, water filters and other materials." Tsendsuren explained that other costs, such as the salary for teachers and staff and running costs were covered by the local education department. And that parents were providing wood for heating and cooking and reindeer milk for the students. "The kindergarten is helping 25 children with their cognitive and social-emotional development," Tsendsuren says. "It is also helping 25 children prepare for school, who would otherwise miss out on this vital opportunity. But we need to make sure all children have the opportunity to access kindergartens". Ulzichimeg and her kindergarten are in the documentary "The Taiga path that leads to mobile kindergarten". Saruul Fischer has built a bridge to her homeland. Homesickness originally gave her the idea for her "Edelziege" label. Today, her eco-fashions from Mongolian goat hair can even be seen at Fashion Week. Classic cuts, subtle colors, and a cashmere look: in her studio in Plauen in Saxony, 39-year-old Saruul Fischer designs both basic and cutting edge ecological fashions. She has her designs made in small runs in Mongolia from 100 percent cashmere wool. Saruul Fischer's label "Edelziege" is indeed a bridge to her original homeland. In 1986, eleven-year-old Saruul and her parents moved from Ulan Bator to East Germany. Her father worked as an interpreter and Saruul went to school. Then the Berlin Wall fell, and hard times followed. Saruul's father died and the family was left destitute. Saruul studied communications, got married and moved to Plauen in Saxony, but she couldn't find work in her field. Then she came up with the idea of "Edelziege" a name both cheeky and a bit provocative but still chic. And it worked: Twice a year, Saruul goes to Mongolia, where she has her designs made up in small factories in Ulan Bator. In addition to environmentally-friendly production methods, she also wants to ensure fair conditions for her workers: Mongolia has undergone some drastic changes, and the advent of the free market has brought more and more families from the countryside into the city. The Mongolian capital Ulan Bator has developed rapidly and today has little to do with the city of the fashion designer's childhood memories. Only on her journeys into the countryside to visit her mother and the farmers from whom she obtains the wool for her label does she find the bit of home she sometimes still dreams about in Germany. "People are modest and live in harmony with nature. That's what I miss most in Germany." But climate change, the migration of the younger generation to the cities and the fight for resources are also threatening the rural idyll. Saruul Fischer shows us around her homeland. We visit the capital where she grew up, she shows us her old school and we go to an orphanage that she wants to support. We travel by car over the bumpy roads through the endless expanse of grassland to the Great Lakes in western Mongolia. We sleep in yurts with relatives and farmers. Saruul Fischer introduces us to a life far from civilization, which will soon perhaps no longer exist. What does Saruul Fischer think of the changes in the land of her birth? What challenges is Mongolia facing? What is left of the empathy with nature she remembers so well from her childhood?